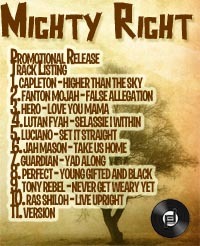 This 11-Track Sampler of Philadub Productions’ Mighty Right Riddim unleashes a summer anthem into the streets of JA and the world. Featuring reggae’s biggest names and a mixture of veteran artists and some of the freshest talent out there today, this riddim will be played for years to come. This series showcases the talent of the Philadub Massive, and we are proud to share these tracks with reggae fans across the world. Preview / Purchase: iTunes .:. Amazon .:. eMusic .:. Napster .:. All Material Copyright © 2002 - 2010, Philadub Productions & Vybz Xpress. Info: Contact Us.